From 1500 to 1700 Spanish jewellers often made lavish use of emeralds. The Spanish had access to immense quantities of gold, silver, emeralds and pearls through their colonies in South America. 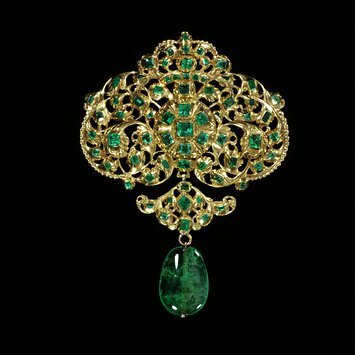 This resulted in opulent emerald-studded jewels unlike anything produced elsewhere in Europe. The reverse of this pendant, however, is engraved with the swirling botanical motifs that were popular elsewhere. Pendant, the scrolling gold openwork is in the form of a bow surmounted by a crown. From the lower edge hangs a spreading triangular segment hung with an emerald drop. Pendant with crown design at top, square emeralds set in gold openwork, with large emerald drop, Spain, about 1680-1700.